Dear Lord, New Version is coming with new heroes of which the introductions are as follows. 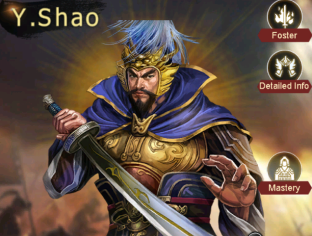 If you have hero Awakened Y.Shao and Y.Shao Promotion Card, you could cost 500 A.Token and click [Promote] to promote the hero. After promoting Y.Shao——God Y.Shao, the sum of his Lead and Force is 150! Besides, he has powerful Water Capacity and naturally owns splendid hero skill——Arrows: Attack 4 rows and 50% chance cause 1.5 Crit in each row. And he has also better talent——Noble: Each fighting row has the first common attack immune and transforms 30% damage into own troops; Yearning: When common attack it will reduce 10% Immune Rate of enemy (Inherit two skills. Reckless). 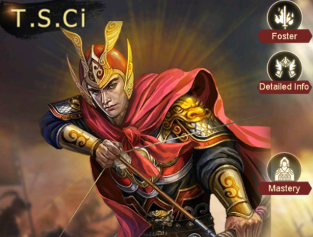 If you have hero Awakened T.S.Ci and T.S.Ci Promotion Card, you could cost 500 A.Token and click [Promote] to promote the hero. After promoting T.S.Ci——God T.S.Ci, the sum of his Lead and Force is 150! Besides, he has also better talent——Hard-fought: each time Force+5 since the hero fights 2nd round, which lasts for 3 rounds; Adept: Dignity buff+5% each time releasing Dignity, Fatal Hit causes "5% fully-recruited * own remaining rows" burst damage (Inherit awakened talent). Such two powerful heroes, what are you waiting for! Come and unlock him, let him help you to rule the whole country!